The modern square toilet is a short projection model, means that it is great for smaller bathroom suites as the pan only projects 600mm away from the wall. The toilet is also equipped with a highly effective dual flush push button which saves water has it has a split button, perfect for those with big families and the toilet is constantly being used! The toilet also features a comfortable soft close toilet seat, no more banging the seat when you go to put it down! 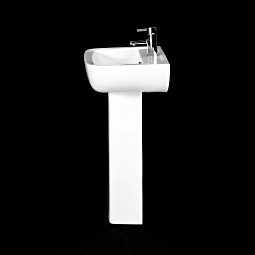 The wide squared basin provides plenty of space for washing and a full pedestal, giving it a gorgeous designer feel. The bath brings a stylish, innovative design to your bathroom that will make all of your guests jealous. This Ceramica single ended square bath really helps to bring your bathroom together, to achieve your dream bathroom. The modern styling has been thought out carefully to ensure that it will fit in perfectly within this suite. The bath can hold up to an astonishing 185 litres of water, meaning you have a lot of space and freedom to move around. This is a great value suite for the price, looks like a more expensive suite once fitted. Great quality. Just perfect! Delivery as promised. Fitted easily. Looks stunning. Thank you.